Sandy Rivera is the Human Resources and Administration Manager and is responsible for the benefits, new hire orientations, risk management, student insurances and assisting with other special projects such as the ER 25th anniversary. She moved from Hollywood, California, where for the past 8 years she worked as a Benefits Manager, Worker’s Compensation Coordinator, and Safety Officer for Jay Nolan Community Services. JNCS is a non-profit organization that assists individuals with Autism and other developmental disabilities. She is an Eagle Rock graduate and is super excited to be back into the community that helped her as a student. 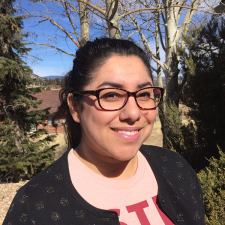 Sandy was studying Business Management at the University of Redlands in California and will continue her education here at Colorado State University. She and her husband now live in Juniper as House Parents with their 2 cats, 1 dog PLUS a baby boy on the way! She loves all animals and all mediums of art. She continues to help the ERS community and the student body in many creative ways and she loves every crazy minute of it! My favorite part of Eagle Rock is the students, the hardworking staff and the nature. Student inspire me when they find their voice in the community.